Hope you are having a good time with family and friends. In my previous article, we had a look at the various aspects of investing in a Mutual Fund. Obviously, a mutual fund might end up giving awesome returns in the longer horizon, but it has its own risks involved. Saving for one's future is a habit which needs be cultivated early in one's career. Disciplined investing for oneself in instruments which compound can create enormous wealth in a matter of a decade. Now, today, let us discuss about playing safe with our hard earned money. By investing in equity or equity related mutual funds, we actually become shareholders of a company or a business. While we would end up making money while the business does well, we also have an enormous risk of losing our capital if the business does not turn out as per expectations of the street. Also, if the overall market loses sheen due to economic conditions, world instability, sentiments etc, we would end up in dire straits. However, imagine a situation where we are lending money to someone else for a fixed period of time. Our capital would be preserved for sure and also, the borrower would pay some pre determined interest to us. Isn't this a much safer option than investing directly into equity or equity mutual funds? This is an instrument where you park your capital with a bank for a fixed period of time after which, you will receive your capital along with interest. The interest is taxed as per your income tax slab set for you. If you close the fixed deposit (by withdrawing your capital) before the maturity period, you will have to pay a penalty for the same. Debentures - Debentures are basically loans given to companies. This is debt for the company, for which the lender (us) is entitled to a fixed interest payment for a fixed period of time. Government Bonds - Similar in concept, only instead of company you have given a loan to the Government. Most debentures have the option of converting into shares of the company after a fixed time. Since the conversion features is present, the rate of interest is generally lower here. However certain debentures cannot be converted into shares. These are called non-convertible debentures. Since, there is no option of ever converting this into shares, the rate of interest is generally higher that the Convertible Debentures. This is where the issuing company gives you a security backing for the debt taken. This can be in the form of some asset of theirs. No security for the debt taken, completely based on the accountability and trust that the company or government will not default the repayment. In payout option you receive your interest payouts regularly and the interest is not reinvested to the capital. The interest earned every year is kept with the company & re-invested which means you are earning interest on interest. Cumulative option has a higher effective yield, i.e. you earn more on them. Debt Mutual funds are those where the capital allocation happens mainly into debentures and bonds. Now, basically, a Fixed Deposit or a Debt Fund will give you low returns as compared to equity investments, but provide a high margin of safety by providing capital protection and interest payment. Now, which is better? Is it Fixed Deposit or Debt Funds? For this, we need to understand a few things. 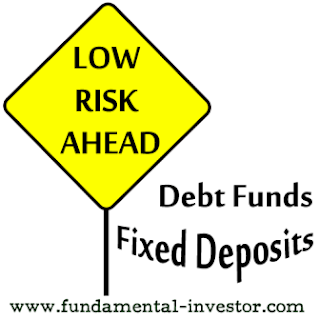 Both Fixed Deposits and Debt Funds would provide almost similar rate of interest to the lender (investors like us). However, when it comes to taxation, there is a good amount of difference. For a Fixed deposit, the tax on the interest earned is as per the income tax slab. Now, let us say that we invest a capital of Rs 1,000,000 (Ten lakh) with an interest of 8% per annum, an inflation of 5% per year and tax slab of 30%. As you can clearly see, the returns from the debt fund clearly beats the returns from the fixed deposit mainly due to the indexation benefit. Now, we need to clearly understand that Fixed Deposits comes with most minimal risk. The debentures and bonds have a clear advantage due to their taxation benefits as shown above. Ideally, the initial years of our career are the ones where we can take a reasonable amount of risk. We may choose to allocate a major part of our portfolio in solid companies and progressive mutual funds. Along with dividends of the companies, we also enjoy the long term tax free capital gains. We can allocate a smaller portion of our savings into debt instruments as well. However, as we get closer to retirement, it is always better to park a large capital in Debt Instruments to ensure a Fixed Risk Free Income. We may choose to allocate to equity as well, but can be minimal. Understanding what kind of person we are is extremely key to investing.. I hope you got a decent understanding of Debt Instruments and its advantages. With this basic information, I urge each of you to dig further and let me know if you have any questions which I can try to answer. We are all learning together.. Enjoy..
Glad that you liked it Vivek sir.. Playing safe is also a strategy in investing which we normally tend to ignore. With the right information, more people can allocate as per their requirement which is the intent of this article.. Goodnight sir.. I must say lot of efforts are put in to make this article easy to read & that too without any jargon. Thanks dear Grays. Please help me to reach these articles to maximum people so that they can benefit..
Also investing through long term investing strategy can avoid certain losses and risks. Short term investing strategies of course promise higher returns but are completely volatile if the market situations get worse. Nice! This is what I have been looking for. I must share this post with my uncle as he is planning to make some investments. He asked me about Cost Inflation Index, capital bonds and other important terms required to know before buying a property or land.